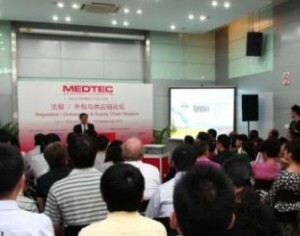 In addition to the value of attending the main event: MEDTEC China 2012; visitors to the exhibition can also avail themselves of the added value of attending the co-located conference and technical forum programs on both days of the show: 26-27 September 2012. The programs comprises a two-day Regulation Conference as well as four technical forums focusing on Orthopedic Devices, Drug Delivery Devices, Diagnostic Devices, and Cardiovascular Devices. The Regulation Conference will kick off on day one with a review of SFDA Regulation Status and Trends by SenYong Lin, Deputy Director of SH FDA. A private sector viewpoint will come from Nancy Meng, Regulatory & Clinical Affairs Manager, Greater China, PerkinElmer, who will discuss SFDA Regulation Changes And Impact For Medical Industry. Furthermore, Device GMP & GHTF Relationships will be addressed by Yanruo Xu, ex-officer of the Shanghai Municipal Food and Drug Administration. An European Union (EU) Regulation Update will be presented by Jean- Pierre Boutrand, General Manager and Scientific Director at NAMSA. Staying in the EU, Faraj Abdelnour, Associate at Synergus AB and President of ACIDIM, will discuss the CE Marking Procedure And EU Market Entry New Requirements. A US FDA Guidance Update will also be presented by Philip Brewster of Brewster Law Firm. Moving to Day Two, John Beasley, Senior Consultant at MedTech Review will present details of ISO 14971’s Risk Management Implementation In The Existing Quality System. Additional presentations sure to be of interest include How to Establish a Quality System in a Medical Device Trading Company by Alex Jiang, QA/RA Manager at Smith & Nephew, and Quality System’s Establishment In Global Transfer Project by Shirley Zhang, QA Director at Zimmer China. Orthopedic Devices continue to be a hot topic in the medical sector and they will be thoroughly addressed at the half-day Orthopedic Device Technical Forum on the morning of 26 September. Among the six presentations, an overview of New Trends And Perspective For Orthopedic Market will be given by Dr. Jian Q. Yao, Senior Director of Research and Development at Zimmer Asia Pacific Region. Other highlights include New Tools for Image-Based Orthopedic Device & Guide Design from Maarten De Vleeschouwer, International Sales Manager at the Biomedical Engineering Unit of Materialise HQ, and The Reality of Smart Implants in Orthopedics and Trauma by Clemens Troche, General Manager at Valtronic. Drug Delivery Devices also constantly feature as a theme high on the agenda in the medical sector and this will be addressed in the afternoon session on Day 1 with five presentations in total. First up will be a presentation on Electric and/or Magnetic Technology for Transdermal Drug Delivery from Dr. Jiali Bao, Professor of the Bioelectromagnetics Laboratory of Zhejiang Province, School of Medicine, Zhejiang University. Modification of Silicone Chemistry and Its Influence on Release Rates of Active Pharmaceutical Ingredients (APIs) is another topic that will surely be of interest to attendees. This presentation will be given by Brian Reilly, Product Director for Healthcare Materials, NuSil Technology. The second day of the forum program kicks off with the Diagnostic Device Technical Forum comprising five presentations in total. First up, Professor Gang (Alex) Chen, Deputy Managing Director at DAAN Gene, will focus on the Outlook for Molecular Diagnostics Market in China. Jim Wang, Software Engineering Chief at MedTech Review, will present a paper on Medical Device Software Lifecycle applying FDA regulation and IEC6230. Addressing an important issue in medical device durability, Dr. Chris Wang, Research & Development Manager at Styron will discuss Advanced Materials For Single- And Multiple-Use Medical Devices Housings. The final forum of the program on the afternoon of Day 2 will dive deep into the latest in Cardiovascular Device technology. Jiang Hongyan, Senior Director of Coronary Products at Microport Medical (Shanghai) is first up with a presentation titled From Metal Stent to Biodegradable Intravascular Scaffold. Continuing on the theme of stents, Lito Mejia, Engineered Structures Business Unit Manager, for Cardiovascular Devices and Engineered Materials at Bose ElectroForce Systems Group, will take a close look at Advances in High Cycle Fatigue Testing of Stent Structures. Three additional presentations at this session round out a comprehensive and pertinent two-day program incorporating numerous topics of significant relevance to the medical device manufacturing sector. MEDTEC CHINA 2012 will also host a value-added service called the Business Matching Program that will link MEDTEC exhibitors with MDTA and CNIMPLANT members. The aforementioned associations, which have partnered with the organizers of MEDTEC CHINA for several years now, will send an electronic newsletter to their members with a link to a “Business Matching Form.” Newsletter recipients interested in the program just need to click on this link, fill out the Business Matching Form, complete the questionnaire, and select up to three MEDTEC exhibitors that they would like to meet in person for business discussions during the event, followed by submission of the form. The organizers then assist with making meeting appointments with their targeted exhibitors. Once the date and time are fixed, both parties are informed accordingly. Furthermore, the organizers will prepare a Business Matching Networking Area in HALL 4 during the event. These efforts on the part of the organizers promise to be a highlight of MEDTEC China 2012 and create new encounters between visitors and exhibitors that are highly targeted.